Ouch! I Have a Mouth Sore! There are few things more irritating than having a painful, swollen sore in your mouth. It bothers you while eating, talking, and even just sitting around. There are a number of types of mouth sores with different causes. Some are infections from bacteria, viruses, or fungus. Or they can be a result of an ill-fitting denture, broken tooth or filling, or loose orthodontic wire. Mouth sores can also be a symptom of a medical condition. Here are some details about common mouth sores. These small sores occur inside your mouth, and are white or gray with a red outline. They aren’t contagious, but are recurring and can happen one-at-a-time or several at once. Experts believe that lowered immune systems, bacteria, or viruses are risk factors. Canker sores often heal by themselves in about a week, and topical anesthetics or antibacterial mouthwashes may provide relief. Also called fever blisters, these sores occur outside of your mouth around your lips, nose, or chin. These blisters filled with fluid are caused by the herpes simplex virus type 1, and are extremely contagious. Once you have been infected with the herpes virus, it remains in your body and occasionally flares up. Cold sores usually heal in about a week on their own. Topical anesthetics may help, and your dentist might prescribe antiviral medications to reduce outbreaks. Also called oral thrush, candidiasis is a result of the yeast Candida albicans reproducing in large quantities. It usually happens to those with weakened immune systems, and is common with people wearing dentures or with dry mouth syndrome. Candidiasis is also linked to taking antibiotics. Controlling candidiasis is done by preventing or controlling the cause of the outbreak. Ask your dentist for advice. Common with tobacco users, leukoplakia are thick white patches on the inside of your cheeks, gums, or tongue. In addition to tobacco use, they can also be caused by ill-fitting dentures or continual chewing on the inside of your cheek. Leukoplakia is linked with oral cancer, so your dentist may advise a biopsy if the patch looks suspicious. Contact our dental office in Ottawa to schedule a dental checkup. There are times when a tooth is so damaged from decay, trauma, or cracking that a filling isn’t the best choice. In these cases, a dental crown may be recommended for long-term tooth health. 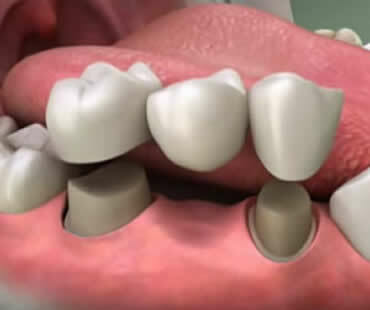 If a tooth is missing completely, your dentist may suggest a dental bridge to fill the gap between two bordering teeth. Dental crowns, or “caps,” completely cover and protect your damaged tooth. It is bonded in place, giving you a stable, strong, and attractive alternative for your original tooth. Because it is customized for you using impressions your dentist makes of your teeth, it is a perfect match in size, shape, and position to your natural tooth. Dental crowns can be the perfect solution to a severely damaged tooth. You won’t need to worry about pain, tooth stability, or your appearance when you choose a dental crown. Depending on what material is used, your crown can look as natural as your own tooth. Dental bridges are designed to span a gap caused by a missing tooth. Having a gap in your smile can affect you in more ways than just cosmetics. Chewing and talking can become problematic as teeth adjacent to the gap begin to shift, leaving the potential for gum disease or jaw issues. Dental bridges literally bridge the gap between two teeth. They are cemented onto the pair of teeth that border the empty space vacated by one or more missing teeth. The bordering teeth act as anchors for the bridge, and are trimmed down to hold a dental crown. Between the two crowns is a replacement tooth, customized for you by your dentist. Once the bridge is in place, you will regain the ability to smile freely while the bridge maintains the shape of your face and lips. You will speak more clearly and be able to eat a greater variety of foods. A dental crown also protects your healthy teeth from issues related to bite alignment. Dental crowns and dental bridges are excellent choices for overall dental health, and can last a lifetime. To prevent damage to your dental work, avoid chewing things like ice or hard candy. It is also important to maintain regular dental checkups.